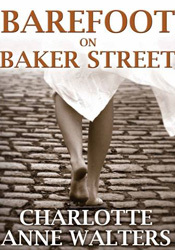 Barefoot on Baker Street is a novel by Charlotte Anne Walters which was published by MX Publishing on September 20, 2011. It is set in the world of late Victorian London, where a life of crime is the only way to escape poverty and servitude for one bright, young, workhouse orphan. The narrative follows Red on her incredible life-journey, in the form of a memoir, as it twists and turns through poverty, riches, infatuation, loss and love. Becoming entangled with a dangerous and sinister criminal puts Red onto a collision course with Sherlock Holmes, who is the focus of a powerful childhood infatuation, and the resulting machinations propel her into adventure, tragedy and maturity. The story is not told by the familiar voice of Doctor Watson and Holmes is not the central character. Barefoot is someone else’s story, someone fresh, intelligent, street-wise and, crucially, female. This allows traditional characters to been seen from a new perspective giving greater insight into their personalities and world. Central themes of infatuation, loss, poverty, social inequality and the journey into maturity are something all readers can associate with, but detailed historical research and sensitive inclusion of source material gives plenty for the Holmes admirer to enjoy. Charlotte Anne Walters is a senior recruitment manager and lives in Shropshire with her husband Tim, a journalist. Charlotte has previously worked as an actor, presenter, and freelance writer. 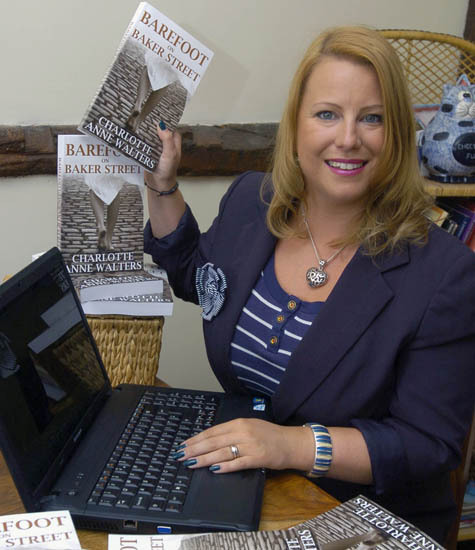 Barefoot on Baker Street is Charlotte’s first novel. To celebrate the publication of the book Charlotte wrote a daily blog reading and reviewing each of the Sherlock Holmes 56 stories. …now have your blog piped through to my reader. All set in keeping updated on your each and every post. Not sure how I found you (link), you know how the interweb can be, anyway, I’m here. Will click on Amz link to get the sample. BTW, have a WIP featuring a modern day version of Holmes, he’s my ‘Jake Spade.’ More later, your blog looks great. Dear Gary – Welcome aboard! I hope you enjoy reading through my blogs. 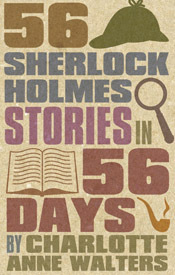 I have just completed my ’56 Stories in 56 Days’ adventure in which I read and reviewed one Sherlock Holmes short story a day until I had covered all 56. The blogs are still up so do scroll through and read my thoughts – feel free to add any comments. There is also info about my novel – Barefoot on Baker Street – and a fun section in which readers have sent in pictures of their ‘Barefoots’ in great locations. Thanks for joining up! I will check out our book and updates. I’ve been a Holmes fan for years. What is your Twitter address? I’d like to follow the tweets. I don’t currently tweet but may do so in the future. I’m not completely in the modern world, still getting my head around Facebook and blogging! Followed this from a friend’s Facebook link. The novel sounds impressive, in both narrative voice and premise; an innovative new take on a classic. And I wholly admire anyone with that attention to detail for such remarkable research. I’ll be hunting a copy down in my local library / Waterstones. Also, a blog dedicated to Holmes, is a very handy thing to have. Thanks for your lovely comment. I really hope you enjoy my novel, I do welcome any feedback. It took seven years to write and did involve a lot of research, I really hope that comes across. The voice is very different from the familiar tones of Doctor Watson and some aspects have been seen as quite controversial. Please try and get a second edition – it is greatly improved from the first. Barefoot (both editions) is available from Amazon and can be ordered from any Waterstones. Thanks again. Hi Gina, thanks for your comment. I have been a Holmes fan for most of my life – reading the canon kept me sane during the stress of doing my A levels and coping with teenage angst in general. Now I’m seeing 40 appear over the not-so-distant horizon and I still turn to Sir Arthur’s words in times of stress. My novel came out in 2011 and I’ve been blogging about general Holmesian stuff ever since. The canon remains my true love but I do enjoy modern interpretations such as BBC Sherlock and Elementary (which grew on me eventually). I am also a big fan of Jeremy Brett and the Granada series in which he starred. It’s great how a shared interest in Holmes brings together people from all around the world. Long may it continue! Would you like to review some of my Sherlock Holmes stories, the second volume of which is published on 11 November? In my spin on things Holmes is a working class bloke living in modern day Middlesbrough. Volume 1 has been very well received. I’ve just followed you on Twitter @northernholmes. if you follow me back I’ll DM to my email address.